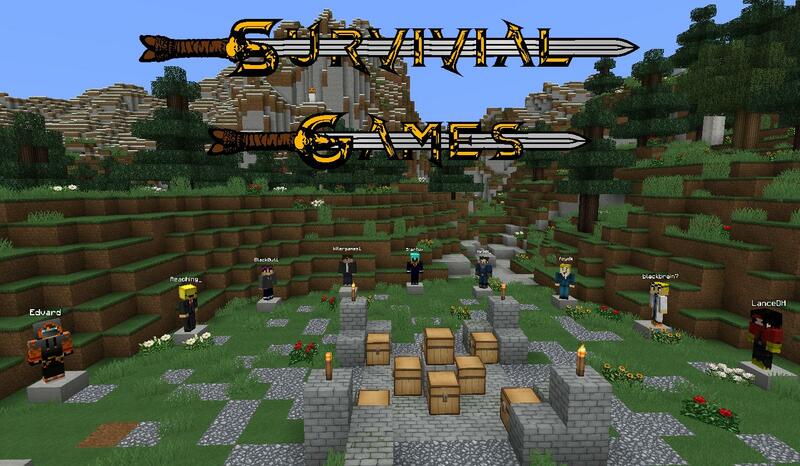 Survival Games is a PvP-based minigame where you collect loot from chests and try to survive longer than your opponents. The game has several phases. Watch the timer in the sidebar to see what phase you are currently in and how long it will last. Right at the beginning, we wait for more players to join if they want to. This is your chance to get your friends to join by using the above commands. The game starts after one minute. The time can be shortened if all players that are currently in the game, hit the ready button. After a brief countdown, a peaceful period starts where everyone can collect loot, with PvP disabled. Take this chance to gear up for the next phase, which is when PvP is enabled and people will try to kill each other. This is the longest phase of the game. PvP is turned on and everybody is on their own. There are different strategies which apply here. You could try and play an offensive style to try and get your opponents out of the way as quickly as possible and collect their loot, thereby gaining an advantage over the remaining players. Or, you could play more defensive and avoid confrontations, thus stay alive and try to collect the best loot from chests. If only two people are left during this phase, they will get a compass which points to the other person left in the game, respectively. If the Fight phase ends without a winner, sudden death mode is begins. In this phase, all remaining players will start at the spawn area, which they may not leave, and fight each other until only one player is left. The Wither potion effect is given to all players, making sure that they all will die eventually, bringing the game to its conclusion, with one winner, or a draw, where nobody wins. The flare is a firework rocket with a one time use per item. If you activate it via right-click, a signal flare will be launched above every person in the game, giving away their location. Use this item if you want to find out if other players are nearby, or where they are hiding. This rare item will always point to the player closest to you. Use this tool to find people to kill, or run away from them to avoid getting killed. This item is automatically dealt to everyone if only two players are left in the game. The Land Mine is a special item which you can lay on the ground as a trap. If a player steps on it, it will explode, killing them and everything around them. Be very careful when you see a land mine on the ground. You can disable a land mine by breaking it with your hands. A highscore is kept which keeps track of how many kills anyone has scored and how many matches of Survival Games they have played. 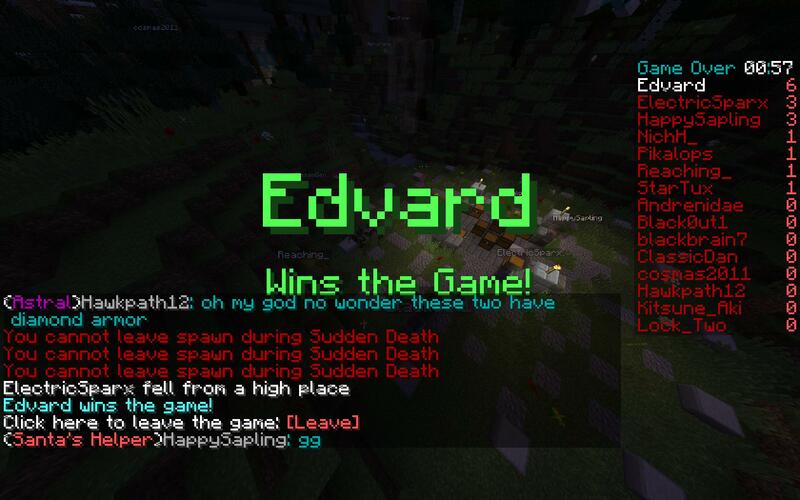 Type /hi if you want to find out how you stack up against other players on the server. We may reset this highscore any time for any reason, such as server events.